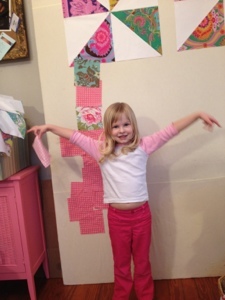 olive and ollie: a quilt designer in the making? 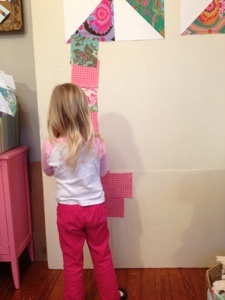 a quilt designer in the making? This is Olivia, my little girl. She's turning four next week--where does the time go??? 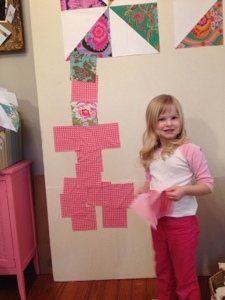 She loves to help me when I'm working in my studio, and yesterday while her older brother was in school, she set out to design a pink castle quilt with some of my scraps. As you can see, she took her design challenge very seriously. 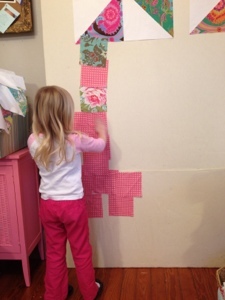 She rearranged some squares, making sure every piece of fabric was in the right place. And in the end, she was pretty happy with her own work. And I couldn't be more proud. I love this!!!! She's going to have a such a creative mind, I can see it.